Fire a banana cannon at a monkey in a tree. The monkey drops from the tree at the moment the banana is fired from the cannon. Determine where to aim the cannon so the monkey catches the banana. The position of the cannon, launch angle and initial velocity of the banana can be varied. 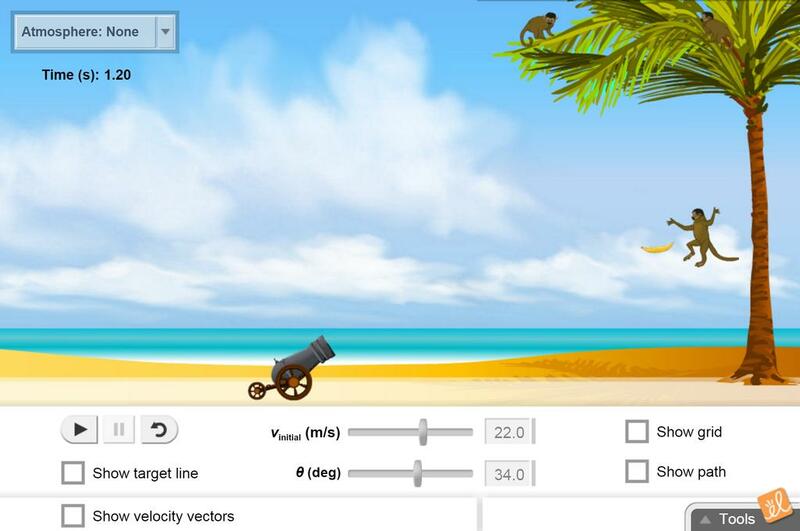 Students can observe the velocity vectors and the paths of the monkey and banana. This activity provides students in senior physics with a chance to study projectile motion in detail. Top... (more)ics discussed include: 2D vectors and components, vector equations, solving quadratics, derivatives, rates of change, etc. Gizmo was great getting my kids ready for the egg drop project!